The film industry has long looked to what happens in real-life for inspiration. Whether it is events such as the Titanic sinking or the Vietnam War, movies have had great success in putting them onto the silver screen to thrill us. As well as actual events, the film industry also likes to use real-life environments and sectors for new ideas. This is seen most evidently in the way that it has used casinos and gambling to base many fabulous films on. This should be no surprise really. Casinos have always had a heady mix of glamour and excitement since the first famous one opened up in Monte Carlo. They allow people to enjoy not only the thrill of gambling and the chance to make some money but also the high-octane atmosphere that most offer. 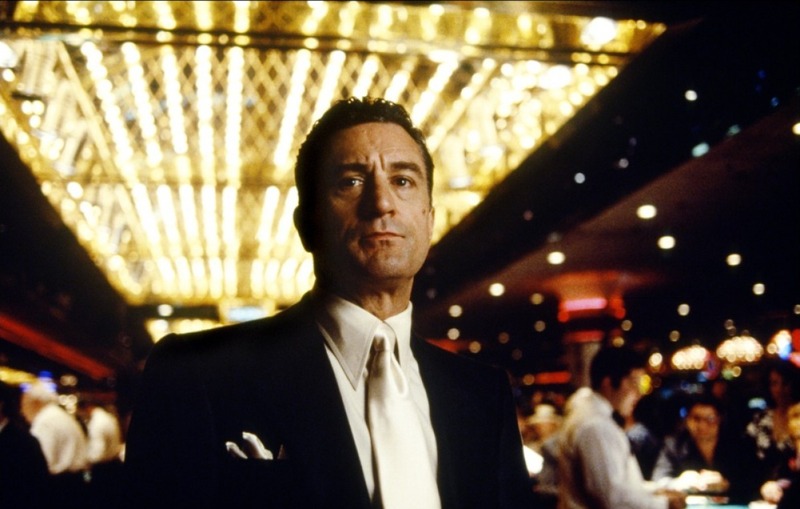 Which are the best films ever made to be influenced by casinos? Here, we take a look at some of the must-see ones from movie history. With a title like that, this blockbuster had to be first up on our list. Released in 1995, it starred Robert De Niro and Joe Pesci on great form, with Sharon Stone also lighting up the screen. It tells the story of the battle between De Niro and Pesci’s characters for control of a casino empire. really leaves an impression after watching it. However, you are still left with the overriding feeling of casinos being fabulous places full of glitz and glamour. We could have gone for the Frank Sinatra original, but the 2001 remake from Steven Soderbergh is simply better. George Clooney stars as titular character Danny Ocean, who gets together a team of criminals to help pull off a daring simultaneous casino heist in Vegas. The movie’s slick, fast-paced dialogue perfectly fits the casino atmosphere it is reproducing. This film has a few of the most famous casinos in the world to check out, in the form of the MGM Grand, Bellagio and The Mirage. Although part of a franchise, many rate the first installment as the best, certainly for casino-related fun. It tells the story of three friends who travel to Vegas to help their other friend Doug celebrate his bachelor party. Ably directed by Todd Phillips, it was a big hit when first released in 2009, and the laugh-out-loud moments that it is filled with show why. If you want a Vegas-based film that has plenty of casino action and outrageous behavior, then this it. This is maybe not as well-known as some other casino-based flicks, but it is definitely worth a look. It stars Kevin Spacey as a gifted math professor helping a bunch of MIT students to win at the table. The story focuses mainly on one student, Ben Campbell, who joins the group to cover the huge fees he needs to fulfil his dream of going to Harvard. Much fun ensues as they hit the casinos in Las Vegas to put their new card-counting skills into practice. As the film progresses, we see just what effect the money they win begins to have on the group. Another casino-related film that has slipped under the radar somewhat is this one starring Matt Damon. Directed by John Dahl and released in 1998, it sees Damon’s character as a retired poker expert who has to come back to the casino table to help rescue a friend. The friend in question has built up a big gambling debt to Russian mobster Teddy KGB. Damon’s character tries to win the money needed to repay this by competing in one poker game after another. Full of excitement, casinos, poker and great acting, this is a brilliant film. All this talk of casino-based films may have you eager to try your luck at the roulette wheel or blackjack table. There is no doubt that playing casino games gives you a real thrill and also a serious chance of making some extra money. If you want to capture some of the glamour that casinos offer without leaving home, why not consider playing online? Online casinos offer lots of games to try out and great bonuses for joining usually. For players in New Jersey, the SugarHouse Online Casino is a great option to think about. If you grab the SugarHouse Online Casino bonus code, then it is even more attractive to play there. As the above shows, films based on or influenced by casinos are amazing. Not only do they give a glimpse into how casinos work, but they are also action-packed and exciting. The next time you do not know what to watch to pass the time, these are a great choice. This review of Lincoln Casino has all the details on this fantastic casino.